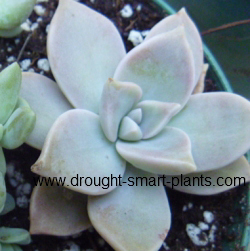 Can you stop at just one more gorgeous succulent plant from many different genera? They're like chocolates - you can't have just one! The varied forms and colours of succulent plants are endlessly fascinating, and addictive. They are becoming more and more popular for drought resistant and colourful container plantings in groups on decks and patios (instead of those high maintenance annuals) and many gardeners now rely on the ease of care, and their textures and beauty. Growing as a selection of these beautiful plants to billow out of a succulent planter as a focal point, or many planted singly in terracotta pots to flow down a set of stone steps, succulent plants are here to stay. They are grown in pocket gardens, mosaics and tapestry gardens, troughs and wreaths. 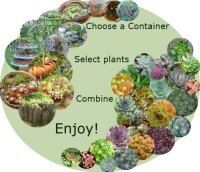 The uses of the wide and diverse selection available are endless. 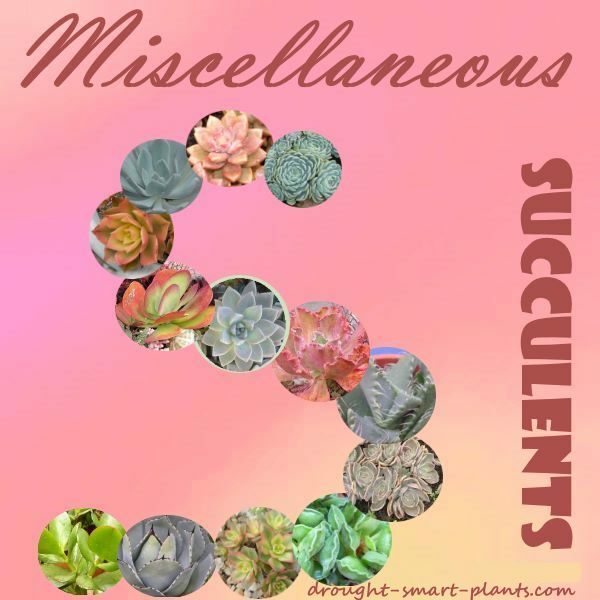 The varied and different types of succulents is pretty much infinite, from strappy and spotted, to chubby, smooth, textured and brightly colored. Enjoy your collection of succulent plants to the fullest by growing them as house plants, close at hand so you can inspect them closely and marvel at their forms and growth habits. Displaying your collection to its full potential is challenging - get inspired to plant these great plants in some unique and different planters and pots. Aloinopsis luckhoffii is one of the tiniest and sweetest plants in my collection. The funny puffy leaves have the strangest texture, almost beaded over a jelly like interior. The colours are distinctive, the slate blue and pale terracotta pleasing to the eye. This tiny pot is only about 2.5cm (one inch!) across, to give the scale of this jewel like plant. Andromischus cristata – this plant looks like little tiny green feet – very cute. It explains it's common name of 'baby toes', which it does in fact look like - pudgy little infant feet. It's also called, Key Lime Pie Plant, or Pie Crust Plant. It eventually will bloom with tall stems and a few dainty little white flowers on top. Ceropegia woodii - Wiry, slender hanging stems sparsely clothed with puffy grey and red heart shaped leaves. Also known as rosary vine or my favorite name, Hearts Entangled. It has a tuber which stores water for the lean times, sometimes almost filling the pot with the strange turnip like structures. 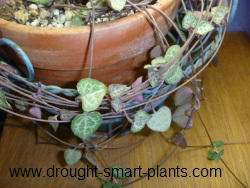 Learn more about this fascinating plant and How to Grow Ceropegia woodii. Just as the name suggests, the leaves of this plant have a wavy edge, giving rise to its species name of undulata. 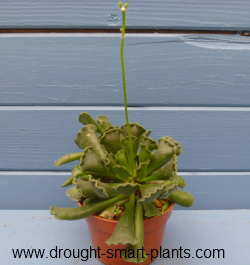 Waxy white bloom covered thick leaves of Cotyledon undulata are held upright forming a cluster. Generally, the leaves of this genus are produced in opposite pairs. Slow growing, but a great addition to your collection. Crassula is one of the most commonly grown of all succulents - especially for novice growers and as a legacy plant. This indicates how easy they are to grow, but nothing could prepare you for their beauty. See more about Crassula here, and how to make them into gorgeous miniature trees, called bonsai. 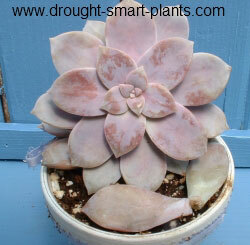 Echeveria are another favorite succulent plant for collectors - it's easy to see why. These lovely plants look like they should grow under the sea, with frilled edges that look like sea weed. They're sophisticated, charming and remarkably easy to grow. Tiger’s Jaws as it’s also called, looks like exactly that – Faucaria tigrina is one of the most charming of these oddball plants. 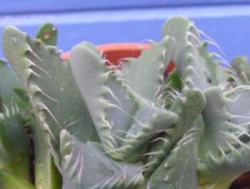 A close cousin is Faucaria felina, or Cat’s Jaws - equally as fun and interesting. 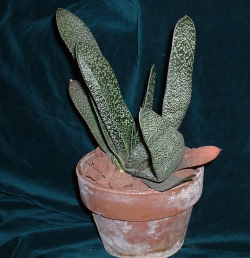 Gasteria brevifolia - Dark green thick strap-like leaves speckled with white spots. This is only one of many different species – many are mistaken for Aloe as they appear so similar, but one way to tell them apart is that Aloe have toothed edges on the leaves, while Gasteria are smooth. It gets its name from the similarity of the blooms to the shape of a stomach. 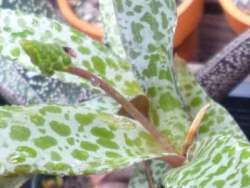 An odd little character, Ledebouria is the Violet or Leopard squill, both names referring to the coloration of the leaves. 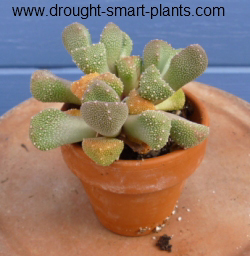 There are several different species in this genus, all cute and interesting companion plants to the more common puffy leaved succulents, and equally drought tolerant and requiring very similar care. I'm always looking for new and exciting plants to add to my collection, and one I've had a fascination with for a long time, but could never find until now is Lithops, also known as Pebble Plants or Living Stones - maybe you'll feel the same way. 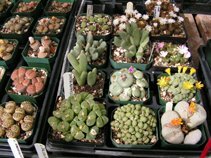 Learn more about how to grow Lithops here. Also known as the Ghost Plant for the thick pruinose on the leaves, Graptopetalum paraguyense is one of the most widely used plants for mixed planters and grown as a single specimen. Its tendency to grow long bare stems with the rosettes dangling down makes it fairly recognizable, along with the colour. Pretty mauve to blue stars of very flat rosettes are a distinctive feature of this lovely plant with the long winded name of Graptopetalum pentalum 'Superbum'. The waxy bloom coating the foliage gives it a very pale appearance. As you can see from the picture, it's easy to damage the pruniose by handling the leaves too much, but don't worry, it will eventually grow back. 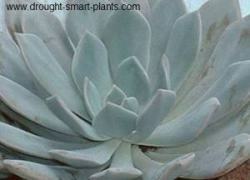 X Graptoveria ‘Debbie’ - Grey blue rosettes of upward curving foliage. 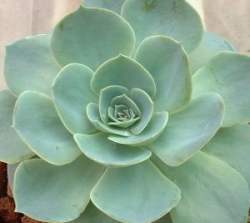 The 'x' in front of the name denotes an inter generic hybrid - which just goes to show how closely related Graptopetalum and Echeveria are to each other. 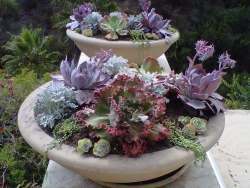 Most hybrids are crosses of two members of the same genus (Echeveria is a genus). 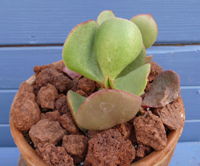 Kalanchoe luciae and Kalanchoe thyrsiflora have been on my wish list for ages - now I've found the K. thyrsiflora to add to my ever growing collection - also known as flapjacks for it's appearance of flat rounded leaves all stacked together. 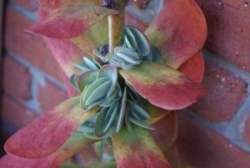 Many other Kalanchoe species fascinate and amaze all gardeners, novice and professional alike. 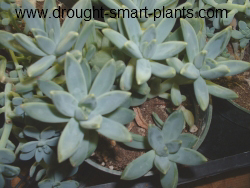 Pachyphytum ovatum - Pale blue round puffy leaves on a chunky stem give rise to the common name of Sugared Almonds. Be careful not to overwater this plant as the leaves will split. As with many members of this genus there is a tendency to drop leaves at the slightest touch, which fall to the soil below the mother plant and root happily in her protection. Pachyveria glauca ‘Little Jewel’ - Soft blue pointed foliage. 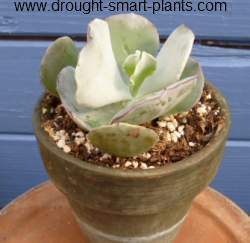 A generic hybrid between one of the species of Pachyphytum and Echeveria, this plant has some of the characteristics of each parent. 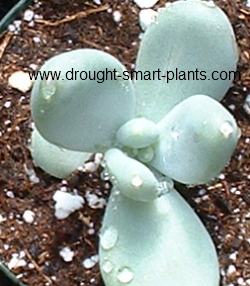 It also has a slight tendency to drop leaves, but in appearance is more like its Echeveria parent. There are many tender Sedum that combine well with other succulent plants – here is just one of many of the genus, Sedum calvifolia. 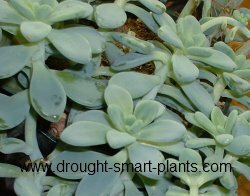 Other favorites include Sedum morganianum, the Burros Tail Sedum, and it's smaller counterpart, S. morganianum 'Burrito'. Sedum nussbaunianum also known as 'Coppertone' for it's tanned appearance is also a well used plant for mixed containers. 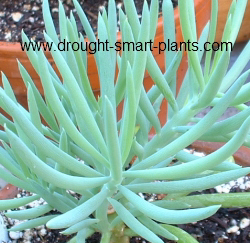 Senecio mandraliscae - Slender pale blue foliage. Interesting scent if the leaves are bruised, similar to larch sap. One of Brad Pitts favorite plants in his garden overlooking the Hollywood sign, and much loved for a larger scale ground cover in warmer areas, and a great spikey tall center plant in containers everywhere else. Senecio rowleyanus - Also known as string of pearls, the bright green pea-like foliage clusters on long draping stems. Great in a hanging container. 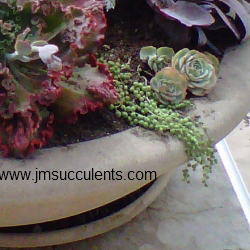 Many designers of succulent containers have great success showcasing other succulents such as Echeveria by using Senecio rowleyanus to cascade over the sides of large mixed containers or as a sprawling ground cover. Schlumbergera, or the Christmas cactus, is well known, and often grown as a legacy plant - this should indicate what a long lived plant this is. Odd shrimp shaped flowers in all shades of white, pink, peach and red open in the fall, sometimes delaying their bloom until well into the new year. 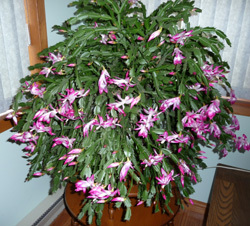 Several similar and related plants all go under the name of Holiday Cactus. you might have the obsession. Sorry, there's no cure except to add more plants to your collection!